Field Trips: Periodically throughout the school year, Share the Earth sponsors field trips into the Milwaukee area, featuring environmental sites in or near the city, such as the Mitchell Park Domes, Growing Power, and the Riveredge Nature Center. As we explore our city, looking at how Milwaukee is responding to a wide range of social concerns, we want to bring forward the work of women of color as healers, artists, activists, entrepreneurs and more, to see other ways that social and environmental justice are connected. 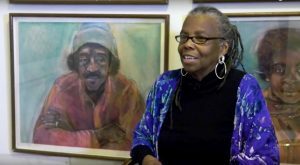 On this tour, we will visit with artist and gallery owner Evelyn Patricia Terry, and with Angela Kingsawan, owner of Yenepa Herbs and educator at Core el Centro. 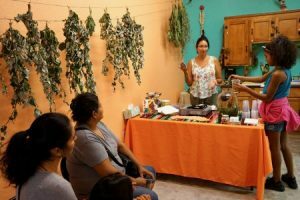 Over lunch at Neu-Life Community Resource Center, there will be the chance to hear from more women who are living and working in counter cultural ways, more connected to the natural world, to strengthen community ties and be healers. Meet in the Union Concourse at 9:30am. Limited to 30 students. Check out our calendar of Share the Earth events for other environmentally focused programs!